We want you to participate in this worldwide event! Help build a "critical mass of concerned voices" each November to focus attention on the species through your efforts and those of other supporters. Rainforests and related ecosystems provide important services from climate moderation, to water quality and erosion control, to storehouses of genetic, species and ecological biodiversity. Rainforests need to be sustainably managed to maintain these services. We want to inform citizens in our own communities of this connection and continue to enlighten local people in areas near orangutan habitat. "Valuing Orangutans over Profit to Avoid Extinction"
The combined impacts of habitat loss, habitat degradation, and illegal hunting have pushed both the Bornean and Sumatran orangutan toward an extremely high risk of extinction in the wild and action is needed NOW to save them and their rainforest homes. 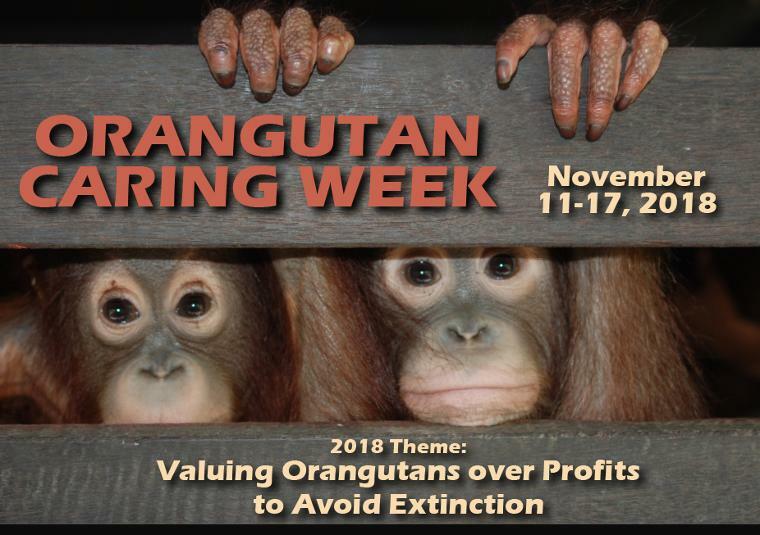 Orangutan Caring Week is a perfect opportunity to spread awareness about the plight of orangutans and the urgent dangers facing their rainforest homes with the goal of motivating people to care – and to care enough to be moved to action! Action is needed to save the orangutan and their rainforest home. If ever there was a time to care, that time is now! Add our Orangutan Caring Week logo to your own photos and posts. Click here for a transparent gif file you can use.